These days what we see on TV, especially about the government shutdown, is not very inspiring. A glance back in time though gives us something we can treasure. On October 5, 1947 a historic television event took place, one that helped fight world hunger. 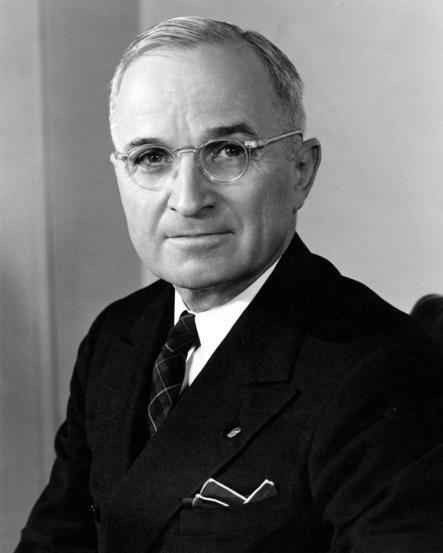 President Harry Truman delivered the first ever televised presidential address from the White House. His speech was about saving lives from the one enemy that remained from World War II: hunger. At the time Europe, still reeling from the war, was suffering from a severe drought. Food was in short supply. Truman asked Americans to conserve food. The Citizens Food Committee was formed to rally America behind this effort. President Truman said, The nations of Western Europe will soon be scraping the bottom of the food barrel. They cannot get through the coming winter and spring without help-generous help-from the United States and from other countries which have food to spare. What happened after this TV address was amazing. Americans came together to donate food to Europe via the Friendship Train which crossed most of the country that fall. The “Silent Guest” program was started during the holidays to buy a CARE package for a hungry person overseas. Catholic Relief Services sponsored a nationwide Thanksgiving Week campaign to collect food at churches. The post-war years saw Americans take action to make sure hungry children overseas received the food they needed to grow and learn. The Congress followed with passage of the Interim Aid bill that provided food for Austria, Italy and France that winter. This food aid led up to passage of the Marshall Plan in 1948 and the reconstruction of Europe. World hunger had a high profile in America’s foreign policy at that time. President Truman, Secretary of State George Marshall and other leaders routinely talked about the importance of fighting hunger. The October 5th television address being one example of this outreach. Marshall also addressed the nation about fighting hunger on October 5th. In order to maintain a steady program of international food aid and development, you need to keep the issue front and center within the halls of government and the public. Making world hunger a top priority is what Representative Betty McCollum (MN) is trying to accomplish with the Global Food Security Act. This bill would create a White House level coordinator for world hunger relief. Aid agencies want this bill passed. It has go through Congress and there is some support. More is needed. We are now facing one of the largest hunger emergencies of our time with the war in Syria. This conflict has caused millions to be displaced and hungry. Afghanistan, Yemen, Haiti, Mali and so many other areas are also suffering from severe hunger. It’s clear that action must be taken. We need a sense of urgency.